I am beginning this series of links to ways we can heal our heavily ravaged planet. They are not truly political in nature. They are simply programs to raise awareness, hold back the seriously bad by-products of industry as it is now, and to confer on avenues of replenishment. To some it would be a presumption that those who crew about spiritual evolution would as well be in favor of alternative solutions to the planet's energy crisis. This is not the case. Just a couple of days ago I chatted with a leading member of our sincere group and learned that he supports XL Keystone. He lives closer to it than I, so who am I to suddenly call him out? Rather, I see him holding this view as a hands-on opportunity for me to love and like better those with whom I disagree on a very fundamental level re how pollution affects the culture and spirit traditions. The crisis is obvious even if we disagree on the science and the amount of human as opposed to other factors in our planet's awesome life. I respect plenty of people on all sides of that issue - again not primarily a political issue, but in the hands of opinion-mongers of various left or right parties, the desperation is enhanced while the best ideas stall. These are all international campaigns. The first is the Leuser, an important rain forest river. The second is a general guide to Greenpeace campaigns. The third is about Coral Reef Conservation. All very dire. I will post more later and hope you do too, as well as take action putting into your own words your vision of things as the opportunities to lobby are diverse.The lines dividing up our oceans are obviously illusory anyway. It's those legal borders dividing countries that need the compassion therapies. This quick correction of "crew" to "care" in the penultimate paragraph. This is one kind of post where one must reread the preview well because it's easier to correct a reply or a blog than a post. Not the time to add more links right now, but this is an op for posting an illustration. Great point! Hemp grows all around the planet and was the one of the best souses for rope and canvas and other textiles. I think some of the first vehicles used hemp plastics for their bodies. The first plastic car was manufactured by the Ford Motor Company, Dearborn, Mich., USA, in August 1941. Fourteen plastic panels were mounted on a tubular welded frame. from wikipedia.org"The first plastic car was manufactured by the Ford Motor Company, Dearborn, Mich., USA, in August 1941. Fourteen plastic panels were mounted on a tubular welded frame"
There's a 1988 flick with Jeff Bridges called Tucker: The Man and His Dream. Another true automobile story, true as how the oil companies colluded with the FBI to demonize hemp. But this one has nothing to do with drugs. Preston Tucker was an inventor - designed a gun turret for the military - Detroit obstructed his vision, scanned for personal weaknesses to bludgeon, and well, you take it from here. I never researched beyond the movie. Here's a shot of British scientists joined by others who have a reasonable perspective on the global crisis. And to underscore the breadth of the moral crisis, remember that nature is the first casualty of war; the byproducts of consumer energy consumption are massive and yet secondary to those losses of water, soil, architecture, human and animal life. Now that this year's climate marches have come and gone, May Day is tomorrow, and here from my meditation perch, I ask myself and God, "How much does my work with light and semi-immaterial forms contribute to the healing of the planet's blue/green oxygenated orbits in partnership with humanity's accumulated industrial waste?" Today is one of those days when I hope that the tears of Americans dedicated to saving our natural resources are not too bitter, angry, or despairing. President Trump made the news this morning by announcing his plan to pull from the Paris Climate Accord. One can wonder how much of this is smoke and mirrors - I have no reason to trust European, African or Asian leaders any more than the Clintons or Trumps. All political leaders make decisions based on information - and public pretenses - that we normal people do not know. Regardless of how horrible this moment is, I take solace in thinking that this is Trump's own version of "smoke and mirrors". He knows the glaciers are breaking. He has heard his daughter and wife. He thinks that he can whip our sensibilities into shape by making us hate him. "You tear it down, we'll build around it." That's what John Lennon said, and way back in the cynical yet life-affirming reaches of his mind - Trump did get to where he is, after all, by being hugely human, he hears people echoing that sentiment now. He does not mind being hated. He relies as much on those who hate him as those who love him in the turning of this industrialized medicine wheel we call Earth. Arizona State University offers sustainability programs considered among the best in the country. Bachelor degrees, masters, online certification, etc. - ASU offers degrees with a vision of engineering supported by the Sierra Club and the Pulitzer winners on its faculty. Education can be a campaign unto itself to redirect the degradation of our natural resources. Meanwhile, I'm signing all the petitions and making incisive comments where space is provided on lots of issues, too many to keep posting here where the focus is on inner work. Bear in mind, industrial and governmental leaders, that the frustration we feel is sincere, that we are good working people who do not need to be told what is best for us when it comes to basics like water and air. We know we're habituated to disposable consumer waste. but when we protest for change, it is out of love first - and a mirroring of this culture's frailty second. What about using crystal grids in specific areas. I watched a kid about 8 years old explain it almost perfectly how crystal grids work. You align the crystals the way the crystals want to be aligned and they will release powerful healing energies to the planet. Search 8 year old builds crystal grid on YouTube. Power of crystals can be truly astonishing if we use them how the crystals willed to be used. The bright lights of Las Vegas flip on when the sun sets, making solar an unlikely energy source for the city. But a solar thermal power station 225 miles away stores the sun’s heat in molten salt, with the capacity to light 75,000 homes far into the night. Nevada’s Crescent Dunes station is the world’s first and only utility-scale molten salt facility. Wildlife advocates initially raised concerns about bird deaths in the power station’s airspace, but operators have taken steps to reduce avian mortality. The LIQUID SALT starts in a cold tank and is piped up a 640-foot-tall tower to the receiver, an arrangement of thin-walled metal tubes. Mirrors reflect solar heat onto these tubes, heating the salt inside them to 1,050°F. Unlike water, which turns to steam at 212°F and becomes more difficult to store, the salt stays liquid at this high temperature. After being heated, the salt is piped back down to an INSULATED HOT TANK for storage. The salt loses only 1 percent of thermal energy per day, an efficiency that helps make this form of energy storage 10 times cheaper than battery technologies. 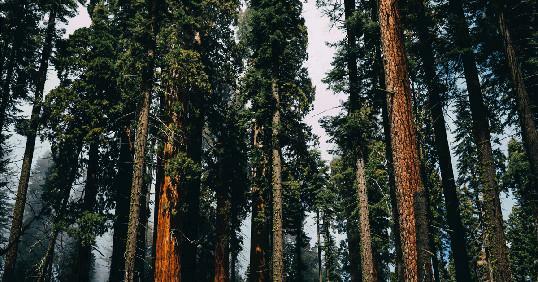 Don’t Let Trump Axe Giant Sequoia National Monument! More than 10,000 MIRRORS, each the size of a billboard, surround the tower. The mirrors swivel to track the sun and reflect its rays onto the receiver. Originally, the mirrors focused on a small patch of air when in standby mode, occasionally incinerating passing birds. Engineers addressed this problem by spreading out the beams across a wider swath of sky. An environmental consulting group estimates that 465 birds die each year across the entire site, which it says is fewer than at wind and fossil fuel plants of the same size. None of the birds belong to a threatened or endangered species. When electricity is needed, the molten salt is pumped to a HEAT EXCHANGER, which powers a steam turbine. The salt eventually goes back to the cold tank. Crescent Dunes can generate 500,000 megawatt-hours of electricity each year, about twice the amount produced by a photovoltaic solar plant of equal size. This article appeared in the September/October 2018 edition with the headline "Salted Away." Eliza Strickland is an associate editor at the technology magazine Spectrum. This petition is to the European Bank for Reconstruction and Development, which still supports dirty fossil gas. Their own experts are concluding we must stop digging beneath where we've already extracted.